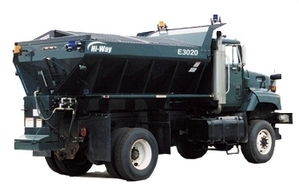 The Hi-Way® E2020XT is the spreader of choice among municipalities for winter deicing. 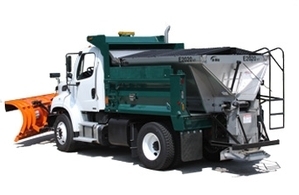 Mounted on a dump body or truck chassis, it features a gearcase assembly that quickly removes for faster service. Featuring a heavy-duty 10 gauge hopper and stakes with 7-gauge conveyor bottom panel and sills, the E2020XT comes standard with a 24” wide roller chain with crossbars for spreading deicing materials and a fully-enclosed height adjustable hydraulic-drive spinner with two internal deflectors. The Hi-Way® E2500 deicing spreader includes innovative features and benefits at a competitive price. 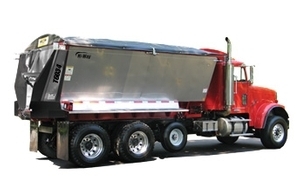 It incorporates heavy-duty construction and a spinner hopper that accommodates spreading, dumping and storage. 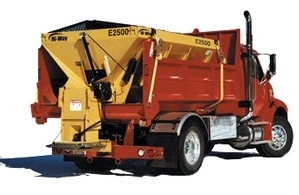 Featuring a heavy-duty 7-gauge bottom panel and 10-gauge body sills, the E2500 comes standard with a 24" wide conveyor chain with cross bars for spreading deicing materials; a heavy-duty spinner hopper which broadcasts material up to 40'; a diverter panel which provides spinner dump-over capabilities without using tools; and a spinner hopper that swings up to 180° for convenient ground storage. The Hi-Way® T6034 Asphalt Transporter conveys more than 23 cubic yards of asphalt per minute, all from the convenience of the cab. The endgate is hydraulically controlled and provides a large 1,170 square inch opening. This unique “power door” ensures a smooth flow of materials, unlike typical live bottom machines that tend to push the materials through a gravity-held endgate and restrict flow. The conveyor speed is also controlled from within the cab allowing other workers to remain a safe distance away from hot asphalt and moving parts. An optional internal metering gate delivers low rates of asphalt or aggregate for patch work and shoulder work. This internal gate easily latches for metering by engaging two pins. When disengaged, the internal gate fully opens along with the external rear endgate for unrestricted flow of material. The T6034 also features heavy-duty construction, a durable conveyor system and is easy to maintenance and service.